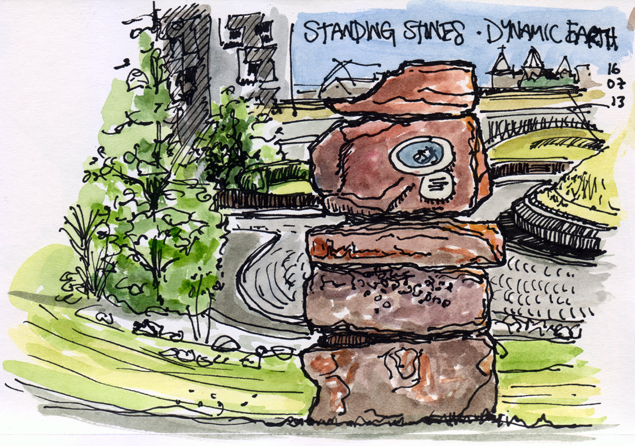 A little early for work on the bike provided an excuse for some pre-office sketching earlier this week, and a wander around the grounds of Dynamic Earth. ‘Our Dynamic Earth’ is an interactive and educational attraction which promises to take you on a journey through the planet’s past, present and future. Situated in between the Scottish Parliament and Arthur’s Seat the buildings landscaped grounds include exhibits of their own, including these standing stones. Several towers of stones line the path up to ODE’s front door, I captured these ones in ink and watercolour with the parliament in the background.